This time, as it's already next week, we start with the upcoming event section. Don't miss Markus Bokowsky on the first German Augmented Reality World on 8th and 9th of November in Düsseldorf. 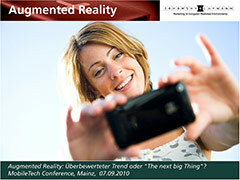 Markus will be speaking about: "Augmented Reality - Reality Check. Which concepts work on which won't in AR". His talk will be 11.45am on Tuesday, 9th November. 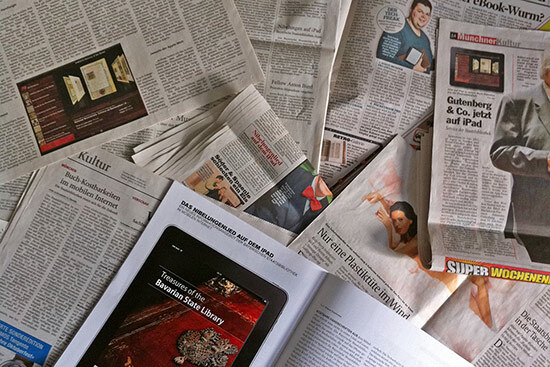 The picture below shows a small selection of the print coverage, it had been mentioned in Süddeutsche Zeitung, Abendzeitung, Bild, Münchner Merkur, tz, WELT ONLINE, Mitteldeutsche Zeitung, inFranken.de, FOCUS Online, Main-Netz, Münsterländische Volkszeitung, Ibbenbürener Volkszeitung, Westfälische Nachrichten, Borkener Zeitung, Ahlener Zeitung, Frankfurter Neue Press, and many many more, you can find the full list here. We post a note on Twitter and Facebook every time we spot a new one, so if you're interested follow us there. It had been also mentioned on TV as well as on stern.de featured by appstory.tv, have a look yourself below. 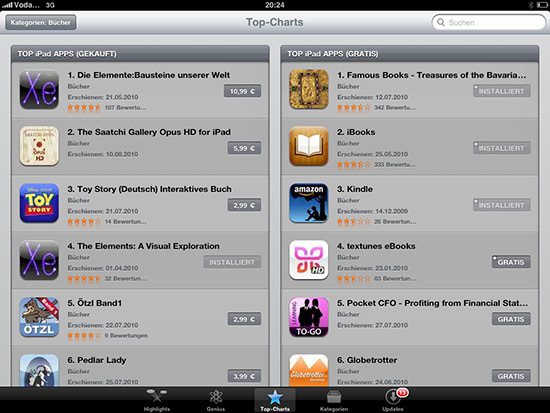 So on August 27, 2010 we ousted Apple iBooks from the no.1 position in the free books section of the German iPad App-Store. And then all of a sudden something happened every developer wants to happen, Apple called and asked for creative to promote the App. 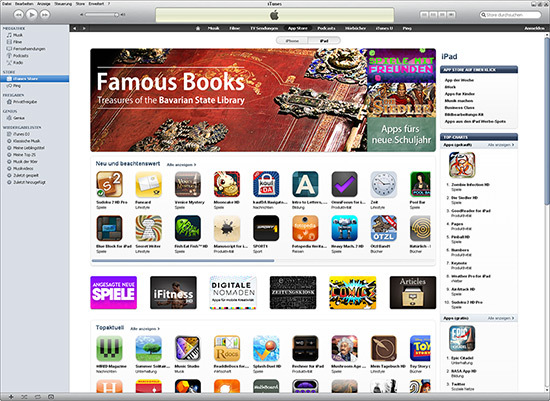 So we'd been on the front-page of the iPad section of German iTunes for a week. Read the full article here (German). 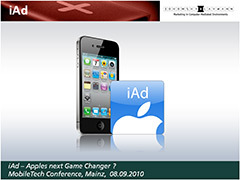 On September 6, 2010 the 1st MobileTech Conference took place in Mainz. It was an incredible event and with more than 400 attendees it became right from start the leading conference for the mobile Development Industry in Germany. Two amazing keynotes from Tim Bray of Google and AR Pioneer Marc Réne Gardeya had been accompanied by a long lineup of high-class speakers from the industry. Among them had been also our very own Markus Bokowsky and Matthias Proske. Markus gave two talks: "iAd - Apples next Game Changer?" and "Augmented Reality - Overhyped or the next big thing?" You can find the slides for both talks on slideshare now. Augmented Reality - Overhyped or the next big thing? Even as it was the last talk of the day, the auditorium at the AR Talk was packed and it seems as people had quite enjoyed the talk. Markus did a quick raffle at the end of the talk and the winners could test-drive Parrots AR.Drone which he had with him and had been brand new to the German market that time. You can find videos of this all over the social web, here is just one video from the official MobileTech Conference YouTube channel. Matthias gave a full day workshop on the first day of the conference called "From zero to hero: A jumpstart workshop on iOS". Unfortunately he got that sick on day 2 that he couldn't give his other two talks, a big sorry also again at this place to all of you who wanted to see him, but I'm sure there will be a chance next time. What's next in Augmented Reality? 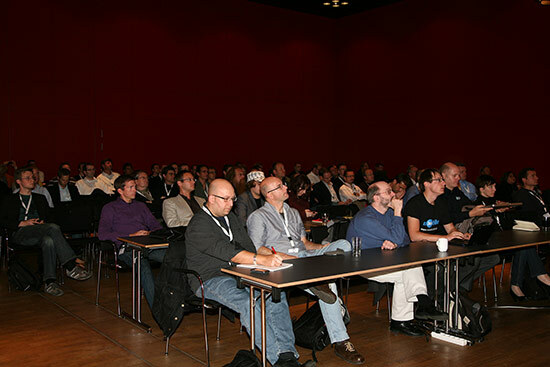 On September 27, 2010 metaio's corporate event insideAR took place in Munich. Read Markus Bokowsky's review on mobile360.de. Markus Bokowsky accepted the position as a member of the strategic planning commission of webinale conference for 2011. Webinale is on the way to become Germanys premiere event covering All The Web: business, design and technology. Webinale 2011 will take place in berlin from 30.06 - 01.07. We are currently in the process of putting together all the necessary bits and pieces to present you a stunning program for next year, so save the date and see your there. Our first hybrid App for iPad and iPhone/iPod touch is now available in the App Store around the world. It was made for the Bayerische Staatsbibliothek (Bavarian State Library), a long time customer of ours and it shows 52 selected manuscripts, unique incunabula and rare, precious printed works from the vaults of the BSB. 52 splendid manuscripts, unique incunabula and rare, precious printed works from the Occident and the Orient, all representing treasures whose originals can be viewed only very rarely in exhibitions. The brilliant, comprehensive digital copies of the exhibits - formatted for presentation on iPad, iPhone and iPod - provide a fascinating insight into the treasures held by the Bayerische Staatsbibliothek. The manuscripts and printed works can be browsed from the first to the last page. Among the exhibits there are for example the manuscript A of the Nibelungenlied, the eight volumes of the Ottheinrich Bible, the Babylonian Talmud or the Parzival epic by Wolfram von Eschenbach." The App was released on 12th of July and made it within 2 days to top 2 in the Free Books section of the German App Store. It holds this position ever since. 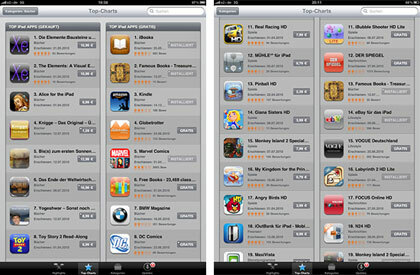 The highest rank in the overall Free App charts had been 11, a success we never though would be possible with an App originally designed for a niche market. "should be 10 stars, Bravo !!!" "Absolutely beautiful material. Thanks to the Bayerische Staatsbibliothek for sharing their treasures with those of us who cannot actually travel there to see these masterpieces in person. I hope other libraries will take the time to share collections with the rest of the world..."
If you want to find out more what actual users of the App are saying, have a look at the German App Store, much more reviews are there in German language. Börsenblatt des deutschen Buchhandels: "Mit der neuen Applikation präsentiert die Bayerische Staatsbibliothek Spitzenstücke aus ihrem Bestand auf iPad und iPhone." W&V: "Parzifall auf dem iPad"
USA Today: "Bavaria offers access to rare books with mobile application"
MacWelt: "Unbezahlbar sind die von der Bayerischen Staatsbibliothek in der App Famous Books präsentierten Bücher. In erstklassiger Bildqualität sieht man 52 Manuskripte und Frühe Drucker aus Europa und dem Orient - und zwar jede Seite!" iPadMag: "Ein Muss für Büchernarren, Historiker und, tja, Bayernfans wohl auch." TeleRead: "Just downloaded the iPad app and it is absolutely magnificent on the iPad. This is what the machine was designed for!" TZ München: "iStaat Bayern - Unter dem englischen Titel "Famous Books - Treasures of the Bavarian State Library" hat die Bibliothek einzigtartige Manuskripte in vollem Umfang hochauflösend digitalisiert - die vorallem auf dem großen iPad Bildschirm sagenhaft aussehen." Before the App has hit the App Store it had been previewed at the Anwenderforum eGovernment, where Deputy Director General Dr. Klaus Ceynowa gave a presentation on the mobile services of the Library. See below some pictures of the conference, u.a. with Dr. Franz-Josef Pschierer, State Secretary at the Bavarian State Ministry of Finance visiting the BSB booth and enjoying the App. If you have an iPad, iPhone 3G or newer or an iPod touch latest generation, we'd be happy if you download the App and let us know what you think. Write a review in the App Store, or post on our Wall on facebook. On September 6-8 the first MobileTech Conference will take place at the Rheingoldhalle Mainz. Leading developers from all plattforms will present their work and share their knowledge with the community. Speakers are among many others: Tim Bray of Google, Patrick Lauke of Opera Software and madvertise CEO Carsten Frien. Our very own Markus Bokowsky and Matthias Proske will also be there to give some talks. Augmented Reality: Overhypted or "the next big thing"? Juniper Research forcasts the market for Augmented Reality Apps at 732 Million US$ in 2014, Gartner puts AR on their Top 10 List for "Disruptive Technologies for 2008-2012". This talk gives you a round up on the status quo in Augmented Reality, shows current and future use cases and outlines available tools and frameworks for the mobile sector. Nowadays Developers for the iOS plattform have to deal with more than one generation of devices when developing and optimizing an App, for sure, there is more to come. This requires a careful usage of resources, you have to find the balance between performance and allocation of resources to make them run also on older devices. This talk gives an overview on the tools OSX provides for resource management and outlines common pitfalls and possible workarounds when developing for iPhones, iPads and iPods of various generations. Since the launch of the iPad earlier this year, developing Apps designed especially for this device is a big issue for every iOS developer. Most of the times, you can't just convert usability and architectural concepts that work fine on the iPhone to the iPad. This talk shows what's different when developing for the iPad, explains, how hybrid Apps work and explain in what situations two different Apps might be the better choice. We'd be happy if you stop by and join one or more of our talks, will be fun, promised. In Mid August a new magazine for developing on mobile devices will see the day of light, the Mobile Technology Magazine. In the premiere issue will be an article by Markus Bokowsky on "What’s new in iOS 4". If you're into Apps, mobile devices at all, check out your local newsagent and grab a copy. We just heard, that there will be an interview with Markus Bokowsky on Create or Die, the webzine dedicated to Design and Online-Business, in the next couple of days. So stop by regularly and find out, what they wanted to know from us. From May 17th to June 2nd 2010 the Goethe-Institut in Lissabon is totally dedicated to “Virtual Realities, Computer Games and Networks”. Within a variety of discussions, conferences and talks different aspects of the topic will be highlighted. All events will take place at the Goethe-Institut in Real World Lissabon, selected talks will be also broadcastet to the Goethe-Institut SIM in Second Life. 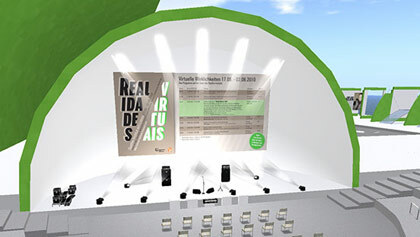 The projekt "Realidades Virtualis" casts a theoretical, practical and artificial glance on Computer Games, Networks and Virtual Worlds. On the versatile schedule you will find Lectures on Game design, World of Warcraft and of cause also Second Life. Also included are Media Art installation and a bunch of tournaments on Game consoles of different generations. Experts in various fields of knowledge will discuss in three conferences the influences and effects of Computer games and Networks on society, the work of information experts and teaching. As part of the conference week, Markus Bokowsky will give a talk on Second Life in Real World Lissabon on 26. May 2010. It will be also streamed to the Goethe SIM in SL, starting 6pm CEST, 5pm local time. If you're in Portugal, please stop by and join. For most of you as experienced Second Life users there probably won't be much news in it, but, of cause we're happy when you join us inworld to watch the stream and participate in the Q/A. Round Table "Virtual Worlds 2020"
A highlight of the conference for us and I guess also for all residents joining inworld will be the round table "Virtual Worlds 2020 - How Virtual Worlds will change the way we learn, life and work in ten years from now" that will take place on Tuesday, 25th May, 7pm CEST on the Goethe-Institut SIM in Second Life. The discussion will be inworld using SL Voice and will be transmitted back to the RL Goethe-Institut in Lissabon. Mixed Reality the other way around. One of the most exciting talks at this year's Internet World in Munich had been Thomas Langs plot on the status quo of E-Commerce and what a shop needs to have in 2010. Markus Bokowsky wrote an article based on this talk in Create or Die. You can read the whole article here in German language. The 2. Bayerische Anwenderforum E-Government 2010 will be the place where our first ever hybrid App will be presented in public. We can't reveal what it is yet, but if you will be there and join the talk at 1.30pm, you'll be the first to know. All we can say: it will be free and absolutely gorgeous ;-) Watch out! One of the events that didn't made it into our last newsletter had been a press round table on Second Life in Business Environments. Mark Kingdon, CEO of Linden Lab gave a brief overview where Second Life for Business stands today and what the future will bring. Frank Börger of TÜV Nord and Hanno Tietgens of Büro X Media Lab presented the activities of TÜV Nord in Second Life, finally Markus Bokowsky gave an introduction to our recent work in Second Life. The outcome of this event had been some quite good press clippings in IT related Media. In case you missed it, we tweeted them all in the last weeks, check out our corporate twitter account. German IT Law: Do you need an Imprint for Twitter? Using the Microblogging Service Twitter is getting more and more popular as an instrument of modern marketing communication. A lot of well-known companies share information concerning their brands and products with their clients via Tweets on a regular basis. So do we and a lot of our clients. And as always, when a former harmless charming gadget is changing into a powerful business-tool lawyers enter the scene and start a discussion about the relevant legal issues. Not surprisingly the German law-blogger-scene discovered the use of Twitter as an interesting topic and raised the question whether the use of Twitter in the course of business communication come under the German Telemedien-Gesetz (TMG, Telemedia law). If this would be the case, every commercial German Twitter account would need an Imprint which shows clearly the ownership of the profile. Although there is still no jurisdiction published, experts tend to agree that Twitter accounts which may be recognized as a content based service with a certain sustainability and beyond private used communication have to be qualified as Telemedia in terms of the Telemedien-Gesetz and therefore are subject to the liability of showing an Imprint. You may find the full argumentation in an interesting paper from attorney Henning Krieg (in German). By the way: Following this legal argumentation will also lead to the obligation showing an Imprint in other Web 2.0 services such as Facebook, MySpace or RSS-Feeds. Most of you know that one of the other fields we are actively developing is our spare part system PlusParts. It currently gets a complete makeover with version 4. The first part we just launched and are really proud of is the new viewer that is used to display the exploded view diagrams. Despite our main competitors we don't need any plugin installed anymore; it's a complete HTML, Ajax solution that runs everywhere even on iPhones and iPads. Trains that are not to overcrowded, still overpriced, but available hotel rooms and compared to previews years a dreamlike parking situation: Welcome to my CeBIT 2010 report in the year of “Less is more”, as usual totally subjective and just my little point of view. But, you know, sometimes also less remains just less and is nothing more than that. For example: Lesser exhibition halls, lesser exhibitors, lesser visitors, because there had been lesser mobile phones, lesser Cameras, lesser Consumer Electronics and so on. All that areas CeBIT had lost over the last years to special fairs. Mobile Communications went to Barcelona to the Mobile World Congres, the Photo industry internationally meets at the PMA or on a national level at the Photokina in Cologne and Consumer Electronics only attends IFA beside the CES. You may argue, that that’s not a big problem as these are special interest areas and not a core part of the IT Industry, but in times of continues convergence of technologies this also means, that we didn’t see some of the important big players like Sony, Philips and Samsung at CeBIT this year at all. We all know, that it’s particularly more complicated to win back lost terrain, than to occupy new ones, so CeBIT Organizers decided to open up the show to a completely new sector, the Music Industry. So we had this year for the first time CeBIT Sounds in hall 22. In theory this sounds like a pretty clever idea, with the end of the popcom, the industry lost their homebase and now this sector of the German fair market is uncovered. But will the starving music industry really want to meet at the place of their biggest enemy, the Information Technology ? I seriously doubt that. And, Hannover don’t get me wrong, but popcom started in Cologne, than they moved to Berlin because it’s supposed to be the more trendy city … and now finally Hannover? Sorry, I don’t think so. So the title of the best know song by the fabulous band “Die Sterne” “Was Hat Dich Bloß So Ruiniert” (what ruined you so much) was a bit of a motto to the whole CeBIT Sounds initiative. Die Sterne played a concert on Wednesday in hall 22, with supporting act Ja, Panik! from Austria. Unfortunately it was very bad promoted by the CeBIT Organizers, so not many people actually knew about it. So, let’s stop engaging in navel-gazing, a typical German thing I have to admit and lets move on to the highlights of the show. There are first and foremost the CeBIT Global Conferences to mention. For a long time I already strongly believe, that trade shows in the IT Industry in the future will only work combined with a (high class) conference program. CeBITs contribution to that concept is called Global Conferences and they are on a promising way. The conference itself had been organized and managed in a professional way, speakers and panelists had been mostly class A. Positioning had been still a bit too broad, but just some more finetuning will be necessary for the future. Most interesting for us of course had been the talk of Linden Lab CEO Mark Kingdon on the topic of “The Ultimate Immersive Experience - Using Virtual Worlds to Connect, Communicate and Collaborate“. Mark’s talk had been professional as usual, the audience had been interested in what he said and Q&A brought up some interesting points. So, basically, that’s all you want. You can watch the video stream of Mark’s talk also here. 3D without glasses: A research project by Frauenhofer Heinrich Hertz Institut. There had been no dominating mega trend this year. Of course Cloud Computing had been a widely covered issue, but we’ve seen that already last year. In my opinion the biggest trend this year had been 3D. You found 3D on 120 Hz computer displays mainly in combination with nVidias Shutter glasses I already mentioned in last years CeBIT report. Unfortunately most of the display manufacturers hided themselfs in the so called “Planet Reseller” where you had only access as a registered retailer or as a guest of on of the exhibiting companies. The special exhibition “Next Level 3D” had been open to everyone, and had been astonishing presentations in a big 3D Cinema. Realtime-Raytracing also possible with XML3D.Hall 9 is traditionally the place for Universities and all sorts of companies from the research and development sector. So, the so called “Future Parc” had been again a place not to miss. Also 3D was a big issue here. Real 3D you can manipulate in the DOM tree showed the German Research Center for Artifical Intelligence with the XML3D standard. This HTML extension makes real 3D in a webbrowser without plugins possible in the future. At the moment you still need to patch your firefox to enable the new 3D elements, but we wish this initiative lead by Prof. Philipp Slusallek best of luck to become a W3C standard. Also a very thrilling project is g.tec’s Brain-Computer Interface. Using an EEG and an interface developed by g.tec you can actually transform your thoughts into actions on the computer. All you need to do is to think about something and the computer will perform the action connected to this thought. It’s actually designed for handicapped people, for instance for patients suffering from the Locked-In Syndrom, but it’s also possible to use this technology to control your Avatar in Second Life. Clemens Holzner shows g.tec’s Brain-Computer-Interface. 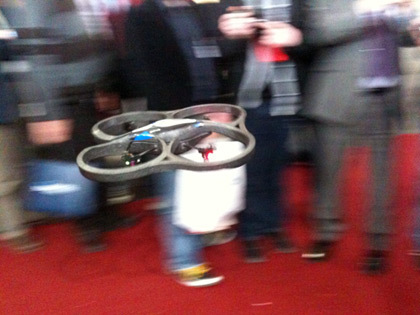 The AR.Drone from Parrot, controlled via an iPhone, have seen it live and it’s even more thrilling then on the Video. 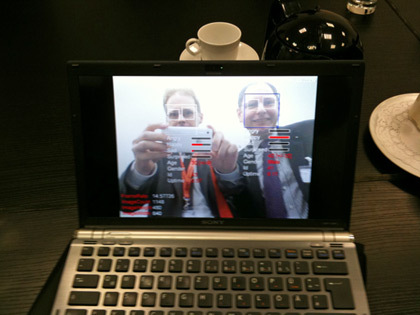 @MarkusBokowsky and @HannoTietgens on a test drive of Frauenhofer’s new facial expression capturing software. Aipteks mini-projectors still need a dark environment. Aiptek, known for their small scale LED-Projectors for the first time showed a full range of products. The low light level made it necessary to demonstrate them in a sort of black box. Funny to watch, but its just a matter of time before the light level will rise and the combination of mobile phone and personal LED-Projector will appear on the Tech Scene. Didn’t convince yet, the Android based Web-Tablet Archos 7.The first Android based Web-Tablets Archos 5 and 7 could be found at the Archos booth at the „Planet Reseller“. Compared to the various completely useless attempts of previews years (or should I say decades) there is hope in this concept. Size and weight is very promising. Regarding the two specific products that Archos showed, they didn’t convince me yet. The display is not brilliant enough and the User Interface reacts too slowly to have fun with the gadget. Without having the chance to test the iPad yet, I suppose it will be miles ahead in terms of quality and usability. The round-tables of the webciety had been very popular again.Hall 6 was again the homebase of the so called Webciety, the place for Web2.0 companies. Again there had been some high-class round-tables and panel discussions. But all in all you could feel, that the CeBIT still has its problems with this colourful scene of Bloggers and Online-Entrepreneurs. When content is more important then technology CeBIT still has some stranger anxiety. In some places of course „Nothing but hot air” – here particularly good visualized by VZ-Networks. I’m very concerned that the end of the CeBIT sausage, the food you have traditionally for lunch at CeBIT, may be near. Many of the familiar yellow snack bars were closed this year, as they are located at parts of the hall that had been closed. And another threat is on the way, our friends from asia may try to take over also the catering sector. In the asia dominated halls 16/17 there had been as part of the “Golden Market” for the first time a Food Court serving asia food run by the exhibitors. Also to China goes the price for the most bizarre innovation, the Singing Lightbulb. “You can have a shower and listen to music at the same time without wasting any space in your bathroom” explained the inventor the concept to me. I’m afraid that after 5 days of CeBIT he may return to Hong-Kong with that horrible feeling that not in every city housing space is such a problem as in his hometown and so for – unfortunately – the market potential of his innovation may be rather limited. That’s it from CeBIT 2010, and to close with a quote by German chancellor Angela Merkel “in 25 years time there still will be a CeBIT” With this in mind, see you next year. BTW: If you disagree or you want to comment on this article, why not become a fan of our page on facebook and post something on the wall. „7000 Oaks“, the work of the current Artist in Residence of the Goethe-Institut in Second Life 0100101110101101.ORG becomes more popular every day. Since the grand opening of the installation end of last year over 300 stones had been taken and oaks had been planted all over the grid. „7000 Oaks“ is a re-enactment of Joseph Beuys' installation with the same name produced for the documenta 7 in Kassel, Germany. The artwork starts with a pile of stones. You can take a stone, so the pile shrinks and you'll receive this stone and an oak tree in your inventory. Now teleport home and plant the tree on your parcel, so you'll become part of the artwork. The oak and stone will tell us their position, so you can track the distribution of the artwork over the whole SL Grid on a map on the web. Now with the "Media on a prim" feature of the new SL Client you can also view the map in-world. Stop by the Goethe-Institut SIM and take your stone and tree, there are still some stones left, but the pile is shrinking every day, so hurry up. Media on a prim - the future of collaboration. Last week Linden Lab released the first public beta version of the Second Life Viewer 2.0. As a Gold Solution Provider we had the chance to get it a bit earlier, so we already had time to play with it and we can tell you, it's a big step forward and will change the way we collaborate in Virtual Worlds completely. The first experience is, that it has a more modern User Interface and that it looks and behaves more like a web browser. Menus and buttons are placed, where Newbies probable will expect them. But the more groundbreaking things happened under the hood. Media on a prim or Shared Media as Linden Lab now calls it, is a standard capability in Viewer 2, that makes sharing standard Web-based media and content in Second Life easy, and enables more compelling, interactive experiences. 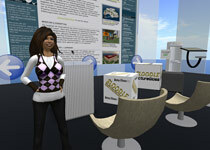 It's possible now to place Web pages, video, Flash content, and other web media, onto any surface in Second Life. We tried it with Google Docs, YouTube as well as a couple of flash games and it all works. A browser-like navigation bar with forward and back buttons. You can even save favourites and review your teleport history. A sliding right-hand panel that surfaces the most frequently-used features and makes managing your profile, contacts, groups, landmarks, inventory, and appearance easy. Improved Search, powered by Google Search Appliance technology, makes it easier to find friends, places, and cool stuff to buy. A superior alternative to invisiprims for non-human avatars. In Viewer 2, a new wearable type, called Alpha Masks, allow you to "mask out" parts of your base avatar to make entire body parts disappear. Sloodle Workshop with Stefanie Rühl and Marissa Bergbahn. On March 23-26 Berlin will be the Capital of Moodle Enthusiastics in Germany and beyond. Humboldt University is hosting the leading conference for Educators using Moodle for e-Learning, blended learning and so on. In 10! parallel tracks you can dive deep into all sorts of Moodle aspects. To add an immersive component to your learning experience, you can connect Moodle with Second Life using the Sloodle Modules. So you can share media stored in Moodle with your virtual users, add content to your blog, use the moodle quiz and much more. If you want to learn more about the possibilities you'll get using Moodle/Sloodle in your e-Learning environment and how to setup and maintain it join Stefanies Rühl's Workshop on March 25th. As one of Germans Pioneers in using Sloodle in a real Learning scenario we had been asked to help a bit and share our experience with the audience, so our very own Marissa Bergbahn will join the workshop from within Second Life and will make it a real mixed Media event. And another Conference we are participating on the panel. Virtual Worlds - Best practices in Education (VWBPE) takes place 12-13 March and is a 48h in-world conference. This year the VWBPE Conference is going to break new ground by having 192 presentations and upwards of 500 presenters over 48 hours present on best practices in education, uses, and impacts of virtual worlds. Last year VWBPE broke all attendance records by bringing over 3800 unique with over 600 new avatars. This year VWBPE are expecting to break 5000 unique avatars coming to the conference. Most talks will also be streamed on the web. Marissa Bergbahn will be part of the Expert Panel discussing the topic "E-Learning in Virtual Worlds: Chances and Opportunities for enterprises". The panel takes place Saturday, March 13, 11am SLT, 9pm CET. If you are in Hannover for CeBIT this year, don't miss Mark Kingdon's talk at the Global Conferences on Friday, March 5th, 11am CET in Room 2 of the Convention Centre. He talks about "The Ultimate Immersive Experience - Using Virtual Worlds to Connect, Communicate and Collaborate." Yes, it's shortened by one day again, and yes, there will be again less exhibitors and visitors, but it's still the biggest IT Show on earth, so let's go. The official claim this year is "Connected Worlds", and it's not hard to predict, that one of the dominant trends this year will be 3D. Hall 6 will again host the webciety area, witch had been one of the interesting places last year, so don't forget to stop by watch a talk or a round table. CeBIT takes place on 3-6 March in Hannover, Germany. Germany's no.1 congress on Internet Marketing not only has a new Logo, also the date has changed again. For many years it took place in Fall, last year it moved into summer time and now it arrives in spring. April 13-14 ICM Munich is the place to be. Expect a 2-day program packed with high-class speakers and an expo showing what's up-to-date in Online-Marketing. Don't miss Markus Bokowsky on the first German Augmented Reality World on 8th and 9th of November in Düsseldorf. In the last issue of this newsletter we introduced you to our brand new iPhone/iPad App "Famous Books" for the Bavarian State Library and it is almost unbelievable what happened since. Markus Bokowsky and Matthias Proske had been also busy writing for the mobile Press. 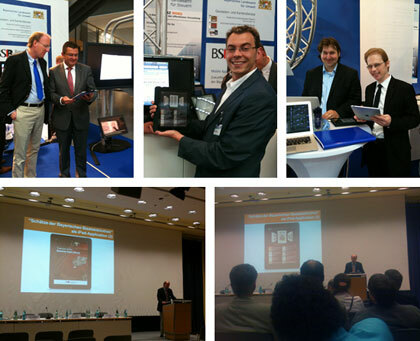 On September 6, 2010 the 1st MobileTech Conference took place in Mainz. It was an incredible event and with more than 400 attendees it became right from start the leading conference for the mobile Development Industry in Germany. Markus Bokowsky accepted the position as a member of the strategic planning commission of webinale conference for 2011. Our first hybrid App for iPad and iPhone/iPod touch is now available in the App Store around the world. It was made for the Bayerische Staatsbibliothek (Bavarian State Library). In Mid August a new magazine for developing on mobile devices will see the day of light, the Mobile Technology Magazine. As part of the conference week, Markus Bokowsky will give a talk on Second Life in Real World Lissabon on 26. May 2010. It will be also streamed to the Goethe SIM in SL, starting 6pm CEST, 5pm local time. A highlight of the conference for us and I guess also for all residents joining inworld will be the round table "Virtual Worlds 2020 - How Virtual Worlds will change the way we learn, life and work in ten years from now"
The 2. Bayerische Anwenderforum E-Government 2010 will be the place where our first ever hybrid App will be presented in public. One of the events that didn't made it into our last newsletter had been a press round table on Second Life in Business Environments. Not surprisingly the German law-blogger-scene discovered the use of Twitter as an interesting topic and raised the question whether the use of Twitter in the course of business communication come under the German Telemedien-Gesetz. Most of you know that one of the other fields we are actively developing is our spare part system PlusParts. It currently gets a complete makeover with version 4. 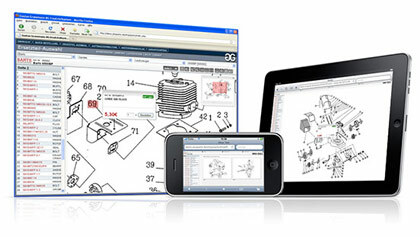 The first part we just launched and are really proud of is the new viewer that is used to display the exploded view diagrams. Last week Linden Lab released the first public beta version of the Second Life Viewer 2.0. And another Conference we are participating on the panel. Virtual Worlds - Best practices in Education (VWBPE) takes place 12-13 March and is a 48h in-world conference. If you are in Hannover for CeBIT this year, don't miss Mark Kingdon's talk at the Global Conferences. Check out "CeBIT" and "Internet World" Germany's no.1 congress on Internet Marketing.